I’m starting a 3-part blog series on indulging in food. This is a multifaceted topic and I find that it leaves many recovering binge eaters confused. So, I’m going to do my best over the next 3 posts to talk about what it might mean to indulge in food, when it may become problematic, and how to indulge in a way that works for you personally. 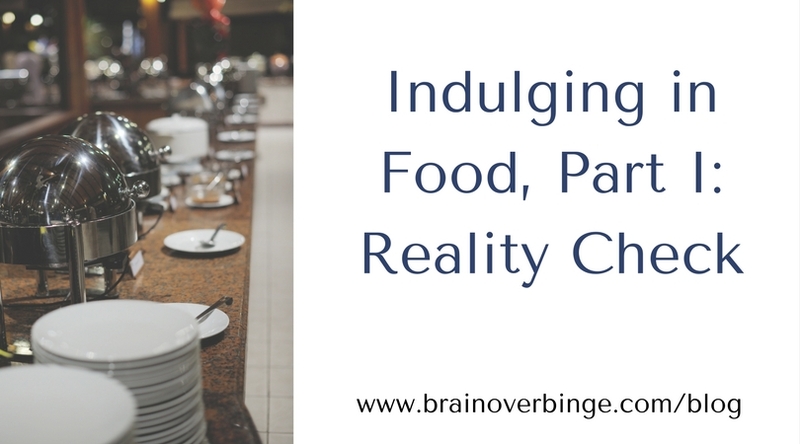 I say what it *might* mean to indulge in food because there is no exact definition, but one thing I want to make clear at the outset is that indulging in food is not the same as binge eating. Binge eating is a much more harmful, life-altering, and out-of-control-feeling behavior, whereas indulging is in the range of normal eating behaviors and it’s typically not a problem at all. You’ve likely heard the phrase “it’s okay to indulge sometimes” (or some variation of that phrase) while trying to end your binge eating habit. This is a common message in the eating-disorder-recovery community, and you’d probably hear some form of “it’s okay to indulge” from any expert in the field. Additionally, most nutritionists, health coaches, fitness trainers, doctors, and weight loss specialists tend to give similar advice, even to people without eating disorders. But, what the advice actually means can be very different from expert to expert; and how the advice is interpreted can be different from person to person. Because there is no definitive consensus on what is just eating and what is indulging, it will be helpful to put some thought into what indulging means to you. In this post, I’m going to talk more about how not to define indulging than how to define it, which I’ll dive into in the next post. You already know not to define indulging in the same way you define binge eating, but I also want to encourage you not to define indulging with a dieting mindset. The primary goal of this post is to help you avoid creating an overly rigid and strict definition of indulging in food. I think it’s so important to do a reality check on these dieting-based definitions of indulging in food. If you are wrapped up in that community, it’s helpful to step back and realize that these “cheat meals” or indulgences for a dieter would be simply be considered eating to the rest of us. For example, the one bite of a dessert indulgence for a dieter may simply be the first bite of a normal-sized dessert for a non-dieter; the dieter’s indulgence of eating anything unhealthy may simply be a normal eaters’s decision to have convenience food when they are hungry and busy; the dieter’s indulgence in something off of their restrictive plan simply doesn’t apply to someone without a restrictive plan. I was recently reading an article from a health writer and mom who talked about allowing her children to indulge in raisins every once in a while. I laughed a little when I read this, because my children would never consider raisins an indulgence. They might consider raisins to be something kind of healthy that I try to get them to eat sometimes. Although I certainly admire someone who feeds their children well, it was clear that my ideas and the writer’s ideas about letting our kids indulge were very different. After being slightly amused when reading about the raisins, another feeling came over me: guilt. I felt like I couldn’t possibly live up to those standards, and although this story is not specifically about binge eating, it made me think about how this type of guilt affects people in recovery. Because I keep a balanced mindset surrounding food, my guilty thoughts about the raisins didn’t last long; but guilty thoughts can take a strong hold in binge eaters, especially those who have overly rigid definitions of indulgence. Even if you tell yourself the common and sound advice that “it’s okay to indulge,” if you define indulging as, for example, having two bites of chocolate, then you are likely to start feel guilty when you take a third bite. If you go on to eat two squares, you might feel like you’ve failed in some way, and if you go on to eat five squares, you might begin having binge thoughts like, “you’ve already blown it, so you might as well eat all of the chocolate…and other desserts in the house…and then start over tomorrow.” You can dismiss those thoughts and urges to binge, but it also helps if you don’t feel unnecessary guilt for having the five squares of chocolate in the first place. A normal eater might consider five squares of chocolate to be a rather typical indulgence, and if it’s high-quality dark chocolate, they may consider five small squares to be an antioxidant-rich, pretty-healthy snack. Seeing that there is more than one way to view certain foods, in certain amounts, in certain situations, can help you break old thought patterns that are holding you back from feeling more free around food. I’m not suggesting that you relax all of your standards, and never try to eat healthy, and be okay with eating too much, too often. I’m only suggesting that you do a reality check on how you define indulging, so that you don’t encourage the harmful restrict/binge cycle. If your definitions of indulgence are based on a dieting mindset, you are much more likely to think you’re over-indulging and then feel guilty, when that’s not necessary, because you’re probably just eating or indulging in a normal way that truly is okay. If you want to end the binge eating habit, you can get my 22-page free eBook, which will teach you all of the basics of the Brain over Binge approach. ← Episode 35: Fostering a Positive Mindset in Recovery: Interview with Katherine Thomson, Ph.D.